BlackBerry refuses to die a quiet death. The Canadian company is currently working on an Android-powered smartphone with a slide-out physical keyboard, codenamed 'Venice', and thanks to some leaked photos released over the weekend we might be getting our first good look at what the device brings to the table. The Venice is a pretty sizable device thanks to a 5.4-inch display on the front, and it gets even larger when the four-row keyboard slides out the bottom of the handset. The display itself is subtly curved to either side, and features on-screen navigation buttons, at least in this prototype version. Around the back of the device, an 18-megapixel camera with optical image stabilization can be seen next to a two-tone dual-LED flash. Along the top edge is a SIM card slot and microSD card slot, while the power and volume buttons are found on the sides. 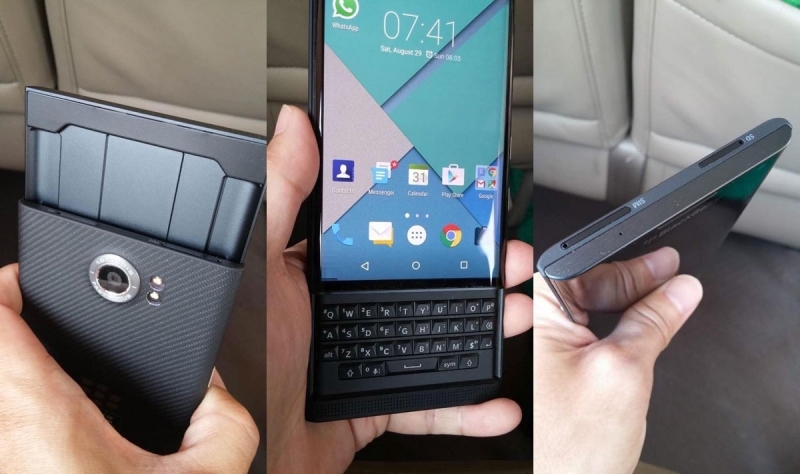 Rumors suggest that the BlackBerry Venice will be powered by a Qualcomm Snapdragon 808 SoC with 3 GB of RAM, and will launch with a customized version of Android featuring some of BlackBerry's business-grade services. Many smartphone users have long abandoned physical keyboards in favor of ever-improving on-screen versions, so the Venice will cater to a niche audience that prefer the tactile feedback of hardware keys. Is this niche audience large enough to make the Venice a success and save BlackBerry from extinction? We'll have to wait until an official release to find out.